This Sunday’s Gospel is a very long parable, and one that is much beloved. It has more layers to it than a first reading will find. The famous German theologian Helmut Thielicke published a book of sermons on the parables half a century ago that took its title from this third point of view, The Waiting Father. He had the wisdom to include two different sermons on this parable. I’ve yet to read them myself, but I think the insight is right: this parable needs more than one treatment. Jesus’ parables are not tidy, like Aesop’s Fables, each with one simple moral. They are often more confusing the closer you look, not least because like in real life, each person in the tale is living a different story. First take the familiar character, the Prodigal Son. He’s the younger of two children, unless there were others Jesus didn’t mention. Something has gone terribly, terribly wrong in this kid’s head. The mistake in his head has led to a problem in his heart – or maybe it was the other way around. Anyway, there is a twist in there somewhere. He has picked up the idea, rightly enough I suppose, that when his dad dies half the property will be his. But somehow he has failed to notice that while his father is alive the whole estate belongs to dear old dad. If the boy wants to be rich now, he should maybe get a job and earn some money. You know the next bit. He takes the money and runs. Far away from parental purview, he spends it all. It’s easy for a storyteller to fill in the blanks. I imagine him hosting fancy parties with magnums of champagne, accompanied by dishes of caviar. Since he’s paying, he has lots of new friends even far from home. But then the money is gone. No money. No parties. No friends. Thus a Jewish boy, far from Galilee, can only get a job tending someone’s pigs. This is, of course, a very big bummer. Depression ensues, followed by hunger, followed by a clear-eyed realization of his error. He’d probably like to make restitution, start over from scratch, fix things with dad. But he has burned his bridges. With the money flat-out gone, he realizes that what he did was flat-out wrong. He’s damaged his relationship with God. He’s damaged his relationship with his father. And those pigs are eating better than he is. He also sees a possible second-best solution: If he can’t undo what he’s done, maybe he can get his dad to just give him a job. At least his dad’s employees have enough to eat. And with that we have a pretty complete Lenten meditation. We too have been snotty to God, wasted God’s gifts, and ended up in a world of hurt. We too need to pursue our second-best solution, get our speech in order, and head toward God to ask if we can be his servants. When you look at the father the story goes several levels deeper into gospel territory. Hey dad! Can’t really wait for you to die. I have things to do. Let me have half your estate now – if you don’t really mind. The thing is, the father does it. In the real world nobody is going to recommend this style of parenting. It just can’t be wise to give your kid virtually everything he or she wants. No, no, of course not. You don’t cash out your IRA and your 401(k) and write a check for half to your son. You set some clear boundaries. You set some reasonable expectations. And you hold on to the PIN to your bank accounts – while, of course, providing generously for your children. But not the father in this parable. This father just goes for it. Is he a fool? Or is he a particularly wise Parent? He gives his rotten son everything. Everything he needs, that is, to reach the end of the only rope that will lead to him seeing his own problems clearly. It is like the dad knew that this kid was an addict who needed to hit bottom. Keeping him in the house was protecting him from himself. Giving him half the estate, while the neighbors gossiped and shook their heads, was the only way. Somehow this particular dad knew that if he gave the boy everything, he would eventually see himself clearly. He could maybe end up far from the promised land, tending unclean animals like the piggy he had become in his heart. Maybe that’s why God allows us the freedom to go our own way. We ask for freedom and he gives it, knowing full well we’ll squander it. But if we squander it, maybe we’ll see what fools we’ve been and come back hoping for a fresh start. It broke the father’s heart to see his son go. You can tell, because the father spent his days on the crest of the hill, looking off in the direction the boy had gone, hoping. That broken hearted love is the key to the gospel here. it was the father who SAW the son — and welcomed him. The lovely thing is that the father isn’t waiting with his arms crossed and his nose in the air, demanding to hear an apology. No, this father rushes to his lost son, grabs him in a bear hug, and won’t even let him finish his apology – Check it out. There was one more line in the prepared speech (verse 19) that gets cut off when the son talks to his dad (verse 21). This father is so overwhelmingly glad that his lost son is back that he gives orders to dress him up and prepare a feast. This isn’t primarily a message about parenting — at least not the bit about dividing the inheritance now. Instead, this is another lovely Lenten message. more eager to welcome us than we are to return. We think we want to be lowly servants; God welcomes us as lost beloved children. We think we come in penitence; God invites us to a party in our honor. But again, that’s not the end of the story. And then, at the end, we hear a totally new perspective on this story from the grumpy older brother. In a sense the grumpy older brother’s story is the original reason for the parable. Back at the beginning of the chapter Jesus was confronted by those who disapproved of him hanging out with known sinners. He told this parable as part of his answer to them. The older brother of the famous prodigal never asked for his half of dad’s wealth. He never wasted his dad’s resources in a fireworks display of extravagant selfishness. He was like the scribes and pharisees who objected to Jesus eating with sinners – they spent all their attention on living as God prescribed in the Law, and figured anyone who didn’t was not to be socialized with. Certainly the grumpy older brother made a reasonable complaint: He behaved well and got no reward, while his dad was extravagant toward a son who had robbed him blind. 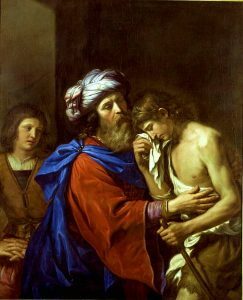 But the father’s message to the grumpy older brother is about compassion: Look at the grief of his father which is wiped out by the younger brother’s return. And from another point of view, despite his complaining, the grumpy older brother really had been rewarded all the while. He got to eat every day. He got to have clothes on his back. He had warm safe place to sleep each night. And he would still have half the estate at the appropriate time. The dad wanted him to have all these blessings plus a little perspective. His little brother had suffered greatly — by his own fault, yes, but he had suffered. His little brother was among the living, back with those who (at least theoretically) loved him most. His little brother was a member of the family, and they thought he was dead – but he’s alive. They thought his little brother was lost forever – but he’s back. And that’s something to celebrate. If the grumpy older brother can get over himself. And that’s yet another good Lenten message. Part of living in repentance is seeing and celebrating others around us. Don’t be a grump, with your arms crossed, nose in the air, ready to condemn someone for their sins. Delight in their growth and repentance. Rejoice in their existence and in the blessings God showers on them — even if you think they are unworthy. I’d love to send you my Monday Meditations, along with my other new articles and announcements. Scroll down to the black box with the orange button and subscribe to my newsletter, and they’ll zoom to your inbox most Fridays. This is a parable that I really do not like. I can whole heartedly relate to the older sensible brother (and to call him grumpy I object)! The part of the story that really hits hard to me is when the father goes to the older son and when the son says yet you never gave me a young goat, the father responds with all that is mine is yours: I come to the realization that the dad is hinting that the older son never asked for a goat to have a party. I wonder how often I missed out on the joy our Heavenly Father wants me to have because I am so focused on being the obedient son, that I forget to ask can I have a party. Thanks Steven. I really appreciate your honesty about how this parable hits you. I think you are on to something in the end of what you say: Yes, he has been in his father’s good favor all along, and could probably have a party just about any time for the asking. In the parable, the father has regained a lost son. It is sadly common to lose a child to illness, addiction, bad company, bad choices… and to get the lost one back is an incalculable joy. The father isn’t rewarding the younger son at all. He is celebrating the end of his own grief and the restored family. In the context, the scribes and pharisees are in the place of the obedient older brother and Jesus himself is in the place of the father. Jesus is glad, deeply joyful, to be reunited to those who have been known by all as “sinners.” The scribes and pharisees don’t see the reunion. They see the “sinners” being rewarded, and condemn Jesus. The thing is, we are not always needing the same thing from a parable like this. It needs to be mined and mulled over, as we consider how the situation does and doesn’t apply. Thanks for these Meditations. I like your reminder than we should rejoice in the good fortune of others, without judging their worthiness. Thanks April! Always great to hear from you. Notice how much of Prof. Levine’s comments here are like midrash — sort of extrapolation, story telling of what might be but is not said. While one can tell the story that way from the silences, I’d say it’s pretty hard to make a firm argument that the Father truly neglected or forgot his older son. All we know is that the father (quite naturally) started celebrating immediately on being able to welcome his younger son without waiting for anyone else to arrive? He couldn’t postpone his happiness, nor could he text his older son to come join in. I imagine a kind of crazy fervor of joy. And 100% of the words spoken to the older son are as loving and generous as can be.